The people of Cuba have begun nine days of official mourning for the death of Fidel Castro, the former leader who turned their small Caribbean island into an international symbol of revolution. Bars shut, baseball games and concerts were suspended and many restaurants stopped serving alcohol and planned to close early. But while Cuba mourns, the expatriate community in Miami continued to celebrate the death of a man they regard as a brutal tyrant. Prince Harry observed a minute's silence for former Cuban leader Fidel Castro who has died aged 90. The prince joined dignitaries from St Vincent and the Grenadine at a reception hosted by the Caribbean country's governor general Sir Frederick Ballantyne who asked his guests to mark the death of the international figure. Among the guests was Prime Minister Dr Ralph Gonsalves, leader of the country's ruling Unity Labour Party, who described Castro as a good friend of his country. Canadian prime minister Justin Trudeau said it was with "deep sorrow" that he learned of Fidel Castro's death and said the revolutionary had made "significant improvements" in Cuba. The late Cuban leader was a friend of Mr Trudeau's father. In a statement, Mr Trudeau said: “It is with deep sorrow that I learned today of the death of Cuba’s longest serving President. Exiled Cubans in Miami's Little Havana took to the streets to celebrate the death of Fidel Castro. One woman said the leader had "separated her family" while a man, whose father had spent two years in jail in Cuba, described him as "a killer". In contrast, Russians paid their respects outside the Cuban embassy in Moscow to the leader who built a communist state on the doorstep of the United States. Castro once said "history would absolve him". The world now waits to see how the revolutionary leader will be remembered. One of the defining leaders of the 20th century, Fidel Castro, who has died at the age of 90, was seen as both pariah and people's champion. He led a coup in 1959 to overthrow the regime of the US-backed former Cuban president Fulgencio Batista, and remained hostile to Washington throughout his life. Castro survived countless assassination attempts, including an exploding cigar, and ruthlessly jailed many political opponents. He also led the world to the brink of nuclear war in the 1960s. Castro stepped down as Cuba's president 10 years ago after suffering a severe gastrointestinal illness, and before his 90th birthday in August he told supporters he expected to die soon. US Vice President-elect Mike Pence has posted his reaction on Twitter to the death of Fidel Castro and called the former Cuban leader a "tyrant". 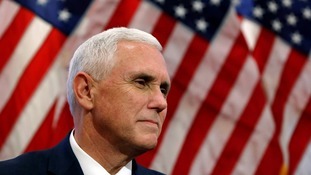 Mr Pence said America "will stand with the oppressed Cuban people for a free and democratic Cuba". US President Barack Obama has released a statement about the death of Cuba's former President Fidel Castro saying that "history will record and judge the enormous impact of this singular figure on the people and world around him." At this time of Fidel Castro’s passing, we extend a hand of friendship to the Cuban people. We know that this moment fills Cubans - in Cuba and in the United States - with powerful emotions, recalling the countless ways in which Fidel Castro altered the course of individual lives, families, and of the Cuban nation. For nearly six decades, the relationship between the United States and Cuba was marked by discord and profound political disagreements. During my presidency, we have worked hard to put the past behind us, pursuing a future in which the relationship between our two countries is defined not by our differences but by the many things that we share as neighbors and friends - bonds of family, culture, commerce, and common humanity. This engagement includes the contributions of Cuban Americans, who have done so much for our country and who care deeply about their loved ones in Cuba. US President-elect Donald Trump has described the late Fidel Castro as a "brutal dictator". In a statement, Trump said he now hopes for a "free" Cuba and said his incoming Republican administration would do everything they can to help the Cuban people. Today, the world marks the passing of a brutal dictator who oppressed his own people for nearly six decades. Fidel Castro's legacy is one of firing squads, theft, unimaginable suffering, poverty and the denial of fundamental human rights. While Cuba remains a totalitarian island, it is my hope that today marks a move away from the horrors endured for too long, and toward a future in which the wonderful Cuban people finally live in the freedom they so richly deserve." Trump's first response had been a tweet, saying: "Fidel Castro is dead!" Trump, who takes office in January, threatened during his campaign to reverse President Barack Obama's moves to open relations with Cuba over concerns about religious freedom. Pope Francis said the death of Cuba's revolutionary leader Fidel Castro was "sad news" and he was grieving. 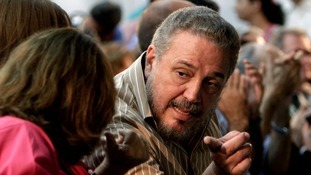 Francis expressed his condolences in a message to Fidel's brother, President Raul Castro on Saturday. The pope, who met Fidel Castro when he visited Cuba last year, said he had received the "sad news" and added: "I express to you my sentiments of grief." Jeremy Corbyn has hailed Fidel Castro as "a massive figure in the history of the whole planet", following news of the former Cuban leader's death. The Labour leader praised the "heroism" of the revolutionary figure and commended the social changes he brought to the Caribbean island. A long-standing supporter of the Cuba Solidarity Campaign, Mr Corbyn's views have courted controversy due to reports of widespread human rights abuses under Mr Castro's rule. 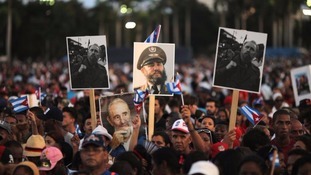 He said: "I think history will show that Castro was such a key figure, it seems he has been with us forever."